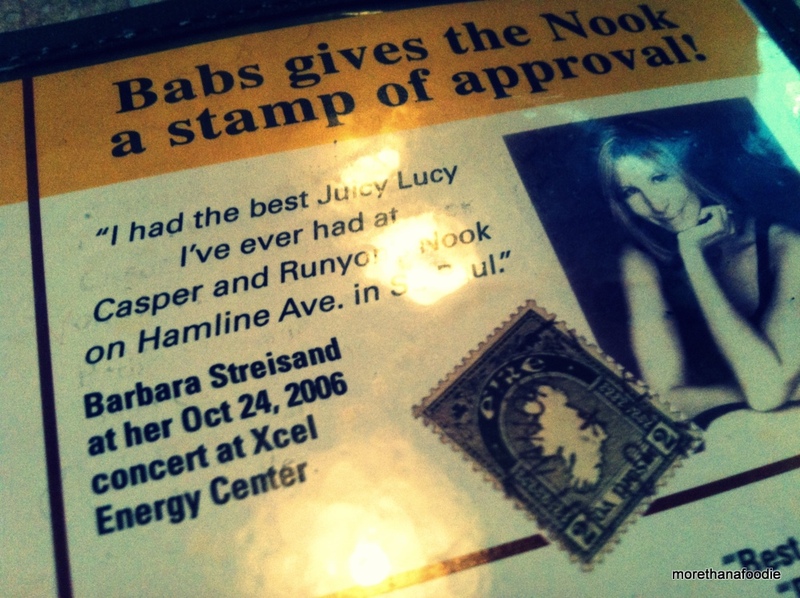 Finally we made it to The Nook in St. Paul. After seeing this place 4 or 5 years ago on Diners, Drive-In’s and Dives we made this our first stop of our trip to The Cities. 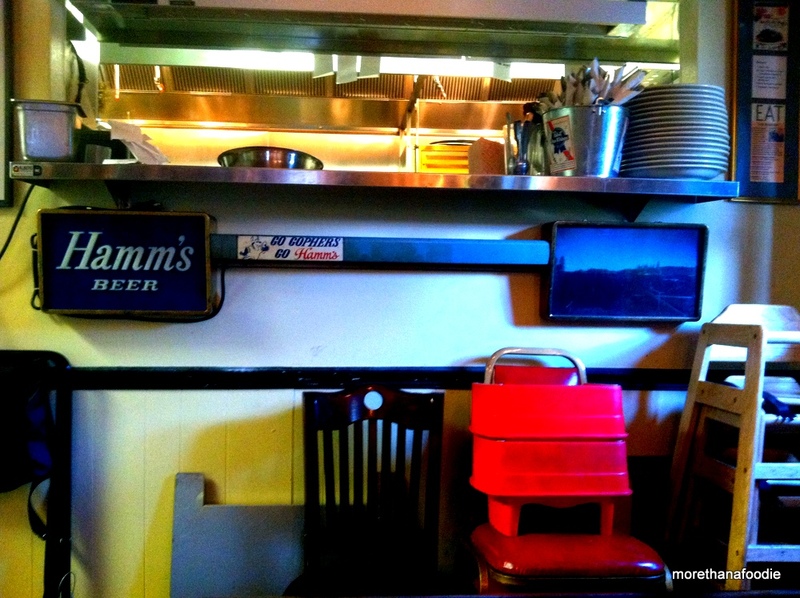 We had been meaning to visit for a long time to try their food and the famous stuffed burgers. There were various reasons we had not stopped but mostly because we have heard it was a small place and always busy. We arrived just after 4pm on a Friday afternoon to find a cozy seat by the kitchen awaiting us. Since their first appearance on Food Network they have had a fire which completely gutted the place, purchased a new restaurant called Shamrocks, and had a second visit from Triple D in 2012. 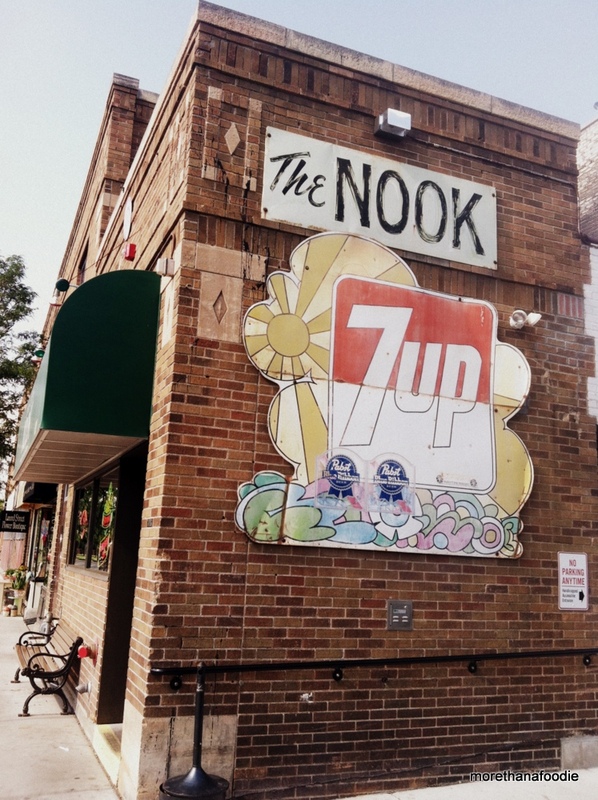 The outside of the building remains the same with the green awning and the 7-UP/PBR sign on the side of the brick facade. My view of the kitchen where the famous stuffed burgers are created. The remodeled space after the fire. Several tables and a full bar with seating. There is more seating downstairs along with a bowling alley. Who knew? Cool art on the front of the menu. You know you are in Minnesota when you can actually get a Leinenkugel’s on tap. Makes for a very happy Chad! 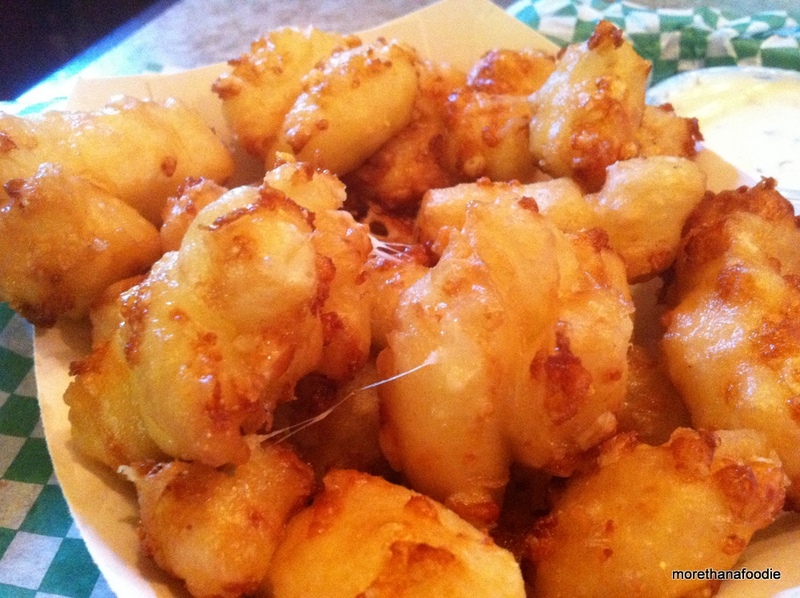 Awesome piping hot #amiatthestatefair cheese curds to start. 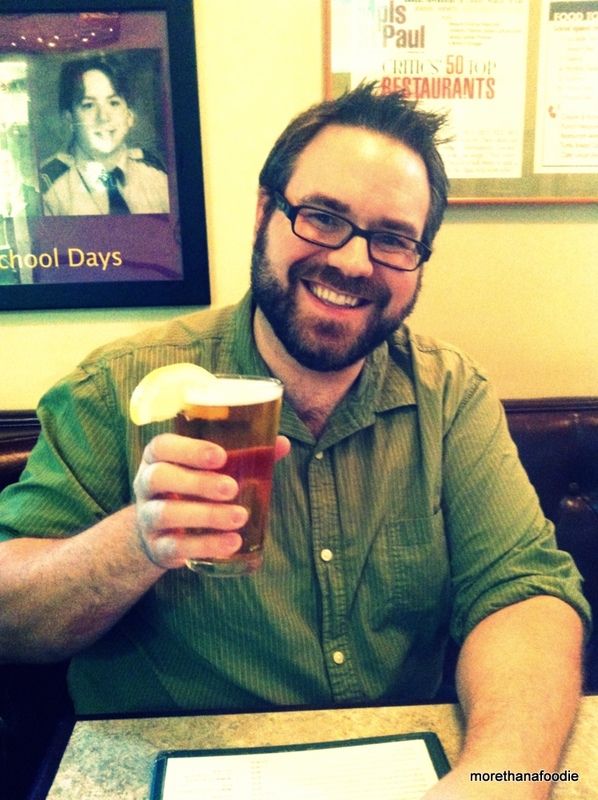 I was the driver on this leg of the trip so I opted for their 1919 Rootbeer on tap. 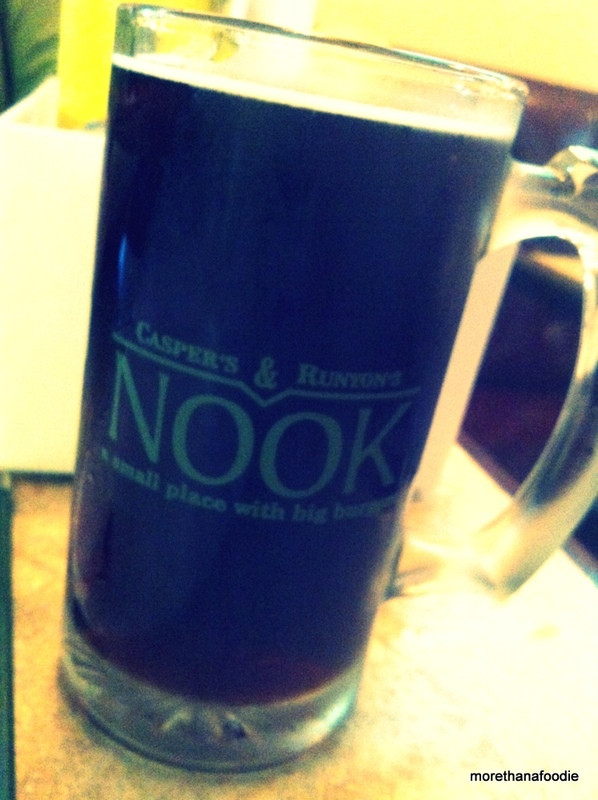 Served in an icy cold namesake mug. It was muy delicioso! The Spanish Fly – A 50/50 mix of beef and Spanish chorizo stuffed with queso cheese. 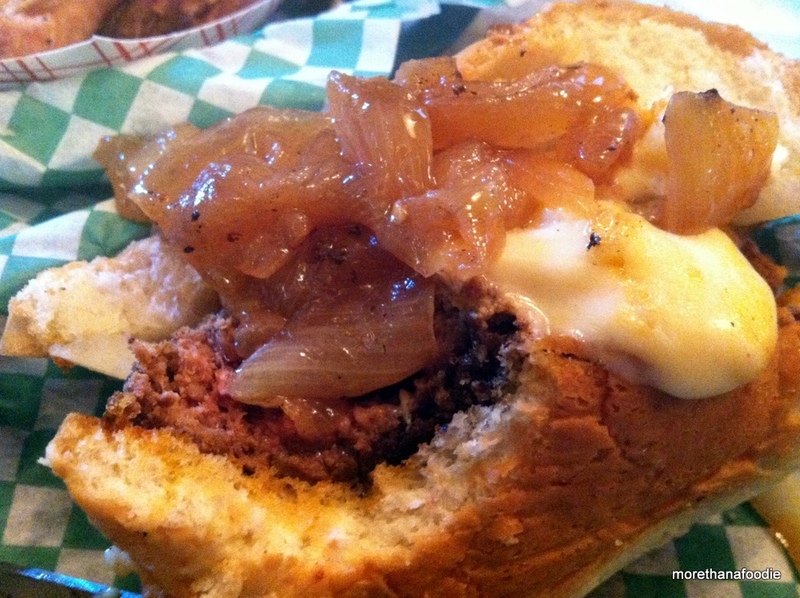 We opted for triple onions with this burger. 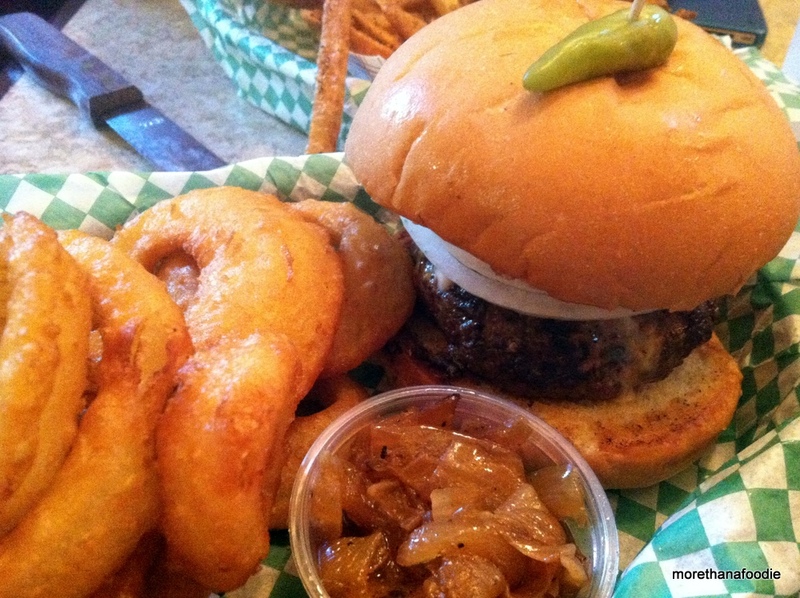 Raw on the burger, onion rings, and caramelized onions on the side. 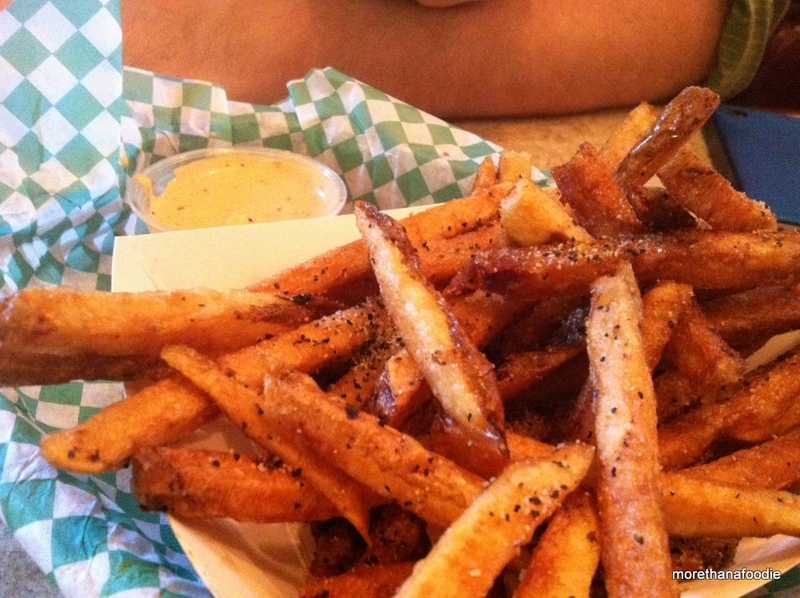 Seasoned Fries – garlic and cracked-pepper seasoning. We shared one stuffed burger because two would have been too much with the sides. The gooey queso ran out of the burger. It was juicy, Lucy. 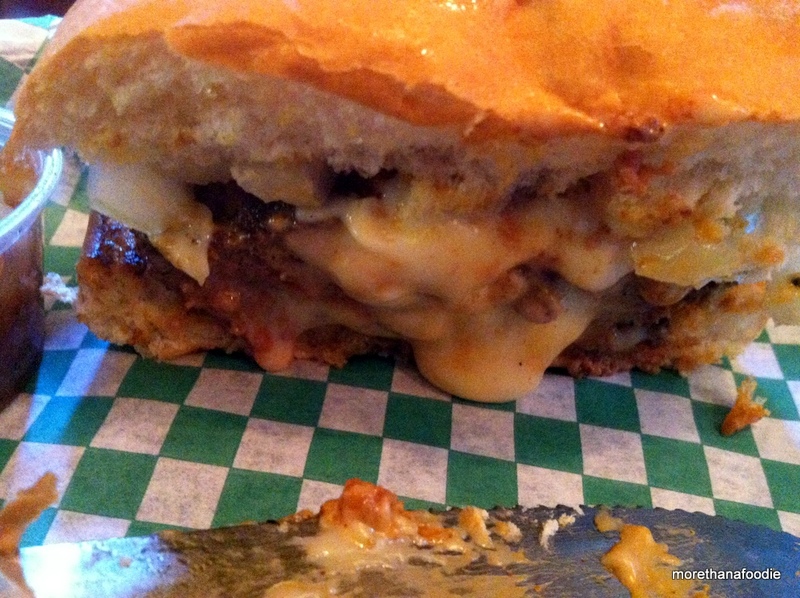 The spice filled chorizo was a welcomed addition to the flavor profile of this burger. Overall The Nook was great. The food was tasty. The menu selection was large. The service was welcoming, informative, and attentive. 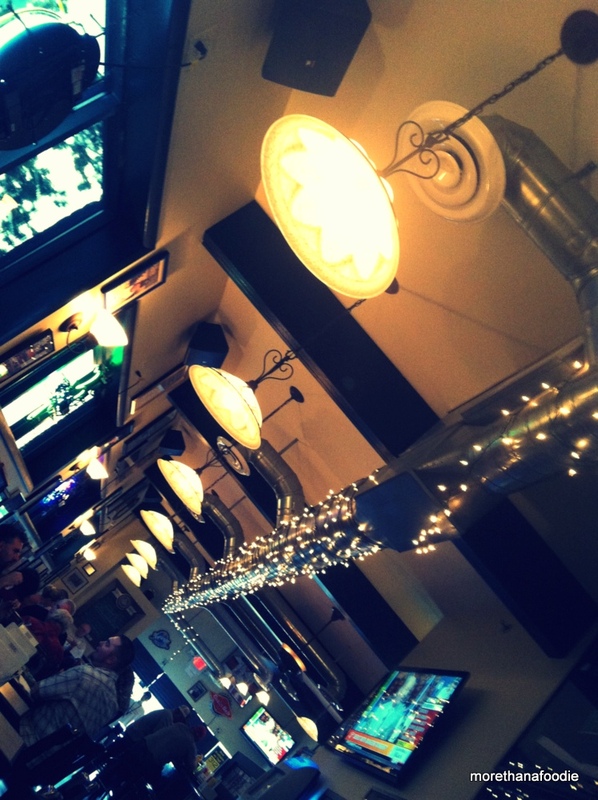 My assumption is the ambiance is more diner than dive since the fire, but it still has its own personality. We will be visit again to try something else before Triple D returns for a third time. 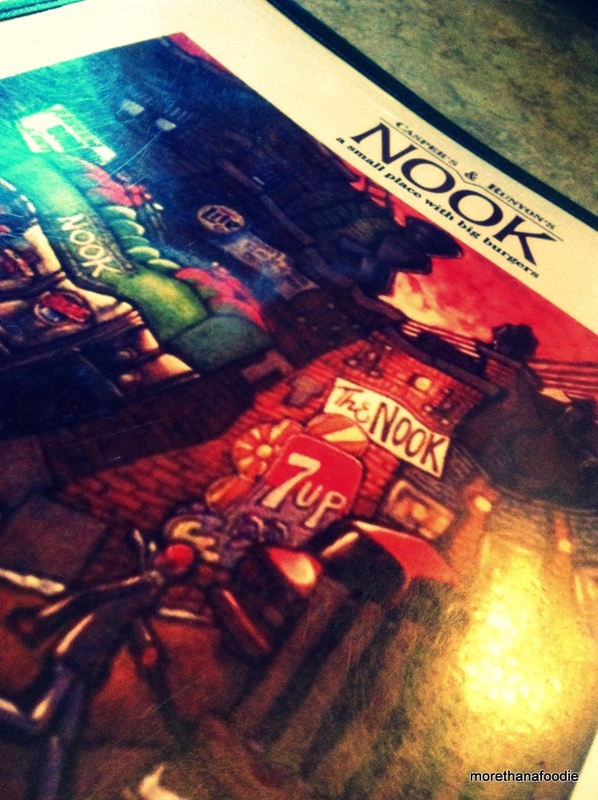 I went to the Nook before the fire but haven’t been back after but it’s great food for a great value! Hey Tanya, thanks for reading! We enjoyed our visit but wouldn’t want to be there when it was crazy busy. We picked the perfect time to go. Hope you are doing well! ← Hatfield Lakes and a Caramel Bundt.